I am a noob but I managed to pick Abus 41/40 four times. I cant tell u the binding order but that's a good start. I think. jerkface wrote: I am a noob but I managed to pick Abus 41/40 four times. I cant tell u the binding order but that's a good start. I think. Good start. BTW, I like your username. It's the same thing I'm called when wife gets angry at me. Seems Protec II are pickable.! Time for Abloy to upgrade. Do you even need to keep it constantly engaged or do you just set it once? The new ball bearing? Well, in Protec I there were teeth/ball bearings that came into the keyway and these did indeed choke space off for tools. Hilariously, the change in Protec II actually leaves more room than Protec I. It is set right at the beginning and then forgotten about. huxleypig wrote: The new ball bearing? Well, in Protec I there were teeth/ball bearings that came into the keyway and these did indeed choke space off for tools. Hilariously, the change in Protec II actually leaves more room than Protec I.
I assume they had to claim that it added some actual functional improvement to get a patent granted. The key has counter surfaces for the balls of the limiting mechanism. The counter surfaces are recesses in the surface of the key. When the key is in the correct place in the key cylinder, the ball of the limiting mechanism on the key side is in the recess of the key, and as the key is turned, the ball on the casing side is able to move away from the hollow of the casing. 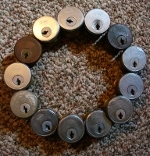 Thus, the key can be turned in order to move the tumbler discs into the correct position for opening the lock. In this case, the inner cylinder is able to turn as turning of the key is continued. The rotation limiter makes the disc tumbler cylinder lock more functionally reliable. However, it is able to rotate in the cylinder lock, when a key is not inserted into the lock. This rotation facilitates the possible picking of the lock. The object of the invention is a disc tumbler cylinder lock, the rotation limiter of which is not able to rotate, when a key is not in the cylinder lock. The object is achieved in the manner described in the independent claim. The dependent claims describe various embodiments of the invention. The locking mechanism comprises a locking pin directed along said line, which comprises, at the end on the casing side, a projection that is transverse in relation to the axis of the locking pin. The projection is arranged, in cooperation with the casing, to prevent the frame from turning, when the key is not in the lock or fully inserted into the lock. The key of the combination comprises a through hole, in which hole a moving element is disposed. The element is arranged to move in the hole such that it is prevented from moving entirely away from the hole. The surfaces of the moving element, which are visible from the through hole, form said guidance surfaces. Additionally, the duplication of a key is more difficult, when there is a moving element in the key. This complicates the production of illegal copies. I guess they couldn't just write "our old patent is about to expire so we had to do something"
About a year later than it should have been - but better late than never, right? 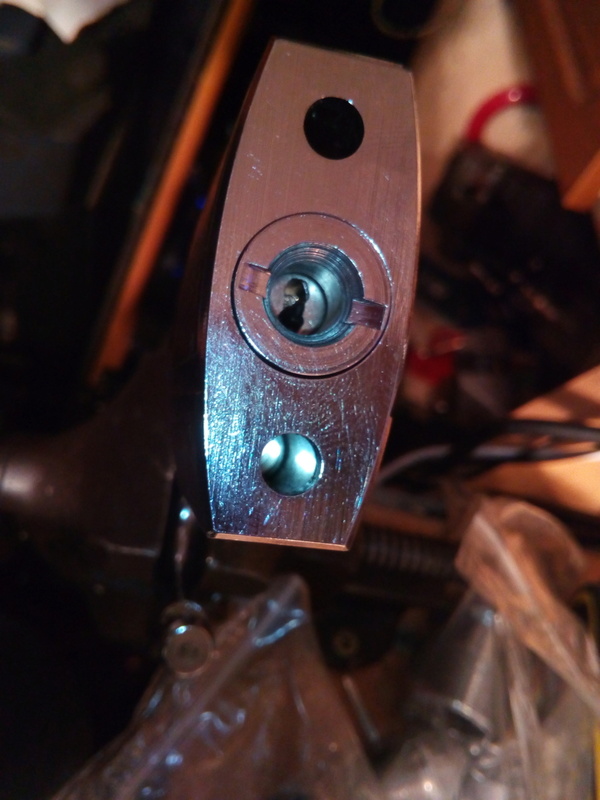 The side mechanism was certainly trickier to learn than the original ASSA Twin 6000 (plus I had to make my own tool for the side pins), but I must say that picking the whole thing was a lot easier. This one, like all Combi's I've encountered, has the new-style ASSA security pins ("double barrel" or whatever you call them). Would be interesting to find a Twin Combi with the old-style security pins ("gin bottle" spools) plus countermilling (deep "pocket" instead of threaded) and compare. I suppose once my ears work again I will try picking another Twin Combi 5600 that I have. It's been sitting around unpicked for 2 years or so. That one I don't have a key for, or any idea what the key looks like, and can't gut, so it'd be totally blind. PS. I could actually pick it with up to 4 side pins using the Schlage Primus tool. However, I was unable to set the side pin at the back without oversetting the pin before it, due to the high/low bitting that you can see in the photo of the key. Wonder if this is custom-pinned or these Combis once came with the old pins? Maybe it's some older model than 5600, just with a similar profile? I have never seen the key or insides of this lock (no way to remove the pins from the top in this form factor). I also hadn't tried picking it at all until yesterday. To my great surprise, I actually got the sidebar picked on the very first try. Wow, I might not be bad at this, after all! Actually setting all of the top pins took a few more attempts since I kept dropping one (or all) side pins. Plus the usual difficulty of dealing with this sort of security pins, of course. The bind order wasn't as nasty as I was fearing from my previous battle with an old Twin. Just set a few top pins, then all side pins, and then it goes into a false set and unless you drop side pins it's open as soon as all top pins are set. I think the top pins are the old-style gin bottle spools, but not entirely sure. I didn't even know Combi (as opposed to original Twin) came with them. Due to the lack of key I'm a bit hesitant to gut it - I suspect it'll be hard to get the damn side pins in place again if I do. 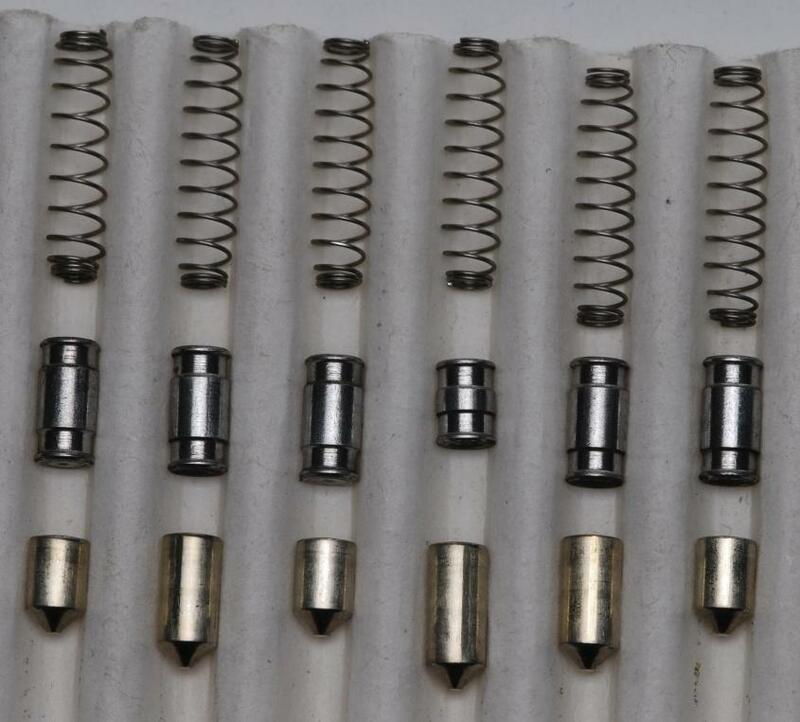 Interestingly enough, if you compare the mechanisms, the top pins would have been a more difficult pick than the side pins! Atleast with the proper tool. Excellent picking Patrick! I have had a Combi for a while now, and have spent long periods trying to pick it with no success. I agree with you, I think the top pins with the barrel spools are harder to pick than the sidebar pins. The profiles in this restricted series have hands down the tightest keyways I have ever encountered. The little wibble at the top still manages to grab a specially thinned .013 pick everytime, so you get very little feedback from the pins. 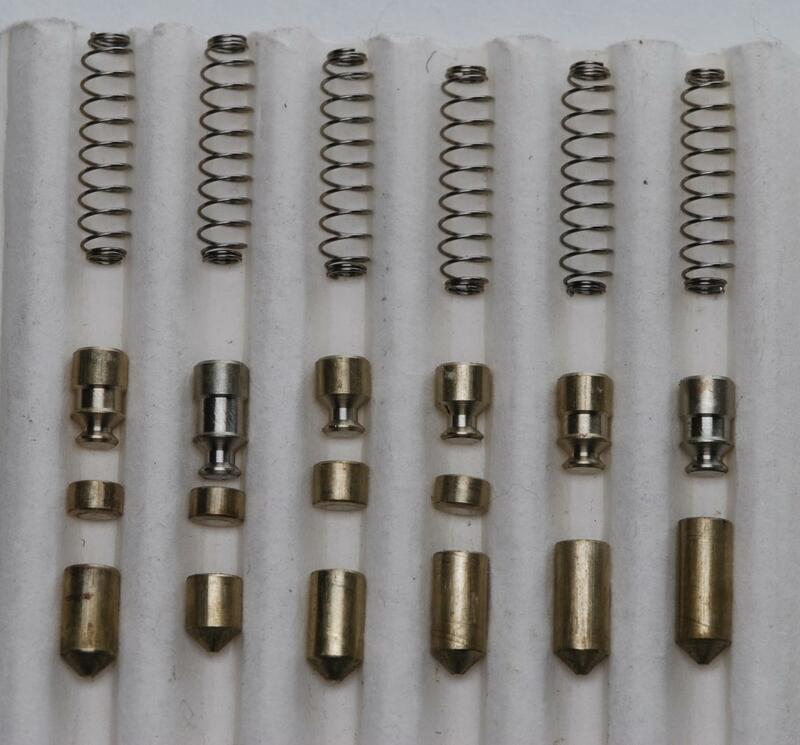 This cylinder is also from the latest revision of the series, which has added 2 ASSA 'T' pins to extend patent life. For those who don't know, the 'T' pins are just pins with 2 different faces, with each one sitting on a different cut in the key. I imagine they have to use a special cutter on the key machine to achieve these type of cuts, I will have to ask for a demo next time I am at that LS. These are the pins I call 'double spools' for lack of a better name. These are the pins I call "gin bottle" and "mushroom cloud"/"Xmas tree". Some (atleast older Twin's) only come with the "gin bottle" version of those, i.e. those that only have one lip and not two. My experience is that with only the 'gin bottle' versions they jam up a lot harder, but behave more predictably. Like tumbl3r (I think it was) noted way back, these are actually easier to pick when there's a sidebar, as long as binding doesn't alternate between individual top and side pins. The reason is that once the entire sidebar is picked, the pressure from the sidebar springs provide some counter-rotation that helps when working the top pins out of the counter-milling. Where did you buy a paint type knife that cost 50p ? Last edited by drewannrez on Fri Sep 14, 2018 12:44 pm, edited 1 time in total. First 7 pin BESTS for me, have picked quite a few now, but have never had any 7 pins in possession before. Big thanks a bunch to RMRFSUDO for the trade, and the Everest Primus padlock, he comes recommended by me Getting better at the BiLock First Gens, all SPP, now have a bunch of different models of the revision so I can get to know them better.